On February 16, protests started in Libya and have been getting bigger and wider. The protests started in the second largest city in Libya called Benghazi and have now spread to the capital city, Tripoli. 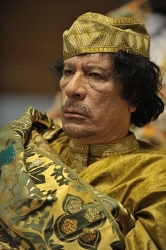 People are demanding that Libya’s leader, Colonel Muammar Gaddafi, step down. Some people who are part of Gaddafi’s government are no longer supporting him. Gaddafi has been the leader of the country for over 40 years. Libyan troops have fired at the protestors, and people have been hurt. The government has blocked the internet and restricted foreign news agencies, and therefore, the outside world does not know the real size of the protests and the injuries. There have been protests in many countries around Libya. It all started in Tunisia in December, when the Tunisians began protesting against their government. Their leader, President Zine al-Abidine Ben Ali, was forced to step down a month later. Neighboring countries where people were unhappy with their government were inspired by this. Egyptian protests forced President Hosni Mubarak to resign on February 11. There have been protests in Morocco, Bahrain, Yemen, Jordan, Algeria, Syria, and a few other countries. The little country of Tunisia may just have started one of the major global revolutions of our times! Libya is the only country that has a flag with just one color – green. Why green? It is because green is the color associated with Islam, the main religion of the people of Libya.